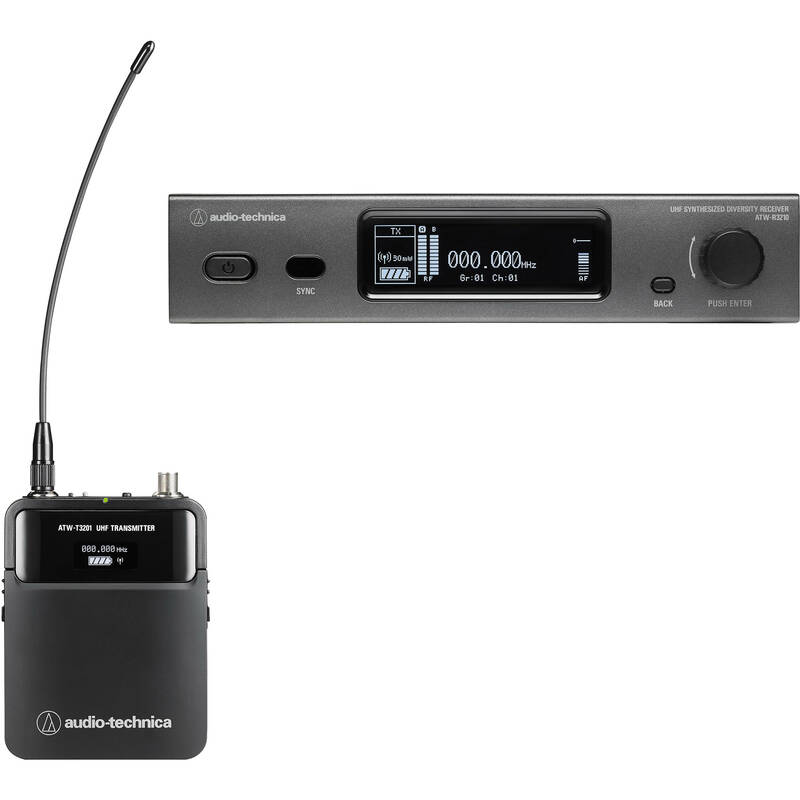 The Audio-Technica ATW-3211EE1 3000 Series Fourth Generation is a frequency-agile, true diversity UHF wireless microphone system engineered to give users the power and flexibility to operate within the congested UHF spectrum. The system includes an ATW-R3210 receiver and an ATW-T3201 bodypack transmitter, and is designed to provide intelligible, natural audio while minimizing potential interference, for stage, television, lecture, event presentation, or house of worship applications. Operating in the EE1: 530.000 to 589.975 MHz band with 2400 frequencies and a range up to 328', the 3000 Series Fourth Generation system offers a 60 MHz tuning range, which is more than twice that offered by the previous versions. Frequencies can be easily scanned and selected on the receiver, and then synced with the transmitter via IR sync functionality. In case of interference, the Multifunction button on the transmitter lets you quickly switch to a backup frequency so you can keep working with minimal interruption. The ATW-R3210 receiver is equipped with two flexible antennas, a balanced XLR output, and an unbalanced 1/4" output. The ATW-T3201 bodypack transmitter is powered via two AA batteries and features a rugged metal housing with a cH-style screw-down 4-pin connector for secure connection to a microphone or cable with a cH-style connector. The ATW-3211EE1 ships with an AC adapter and rackmount adapters for the receiver. Note: Does not include a microphone. Select a microphone or cable with a cH-style screw-down 4-pin connector to complete the system. Box Dimensions (LxWxH) 15.1 x 13.3 x 3.2"